Just as investments in the oil sands are useless without a pipeline to get the product to market, so too are the investments in health research without a pipeline to guide basic science discoveries through the multitude of complex hurdles before getting an approved drug to the people who need it. Alberta is home to a world-class Faculty of Pharmacy and Pharmaceutical Sciences that is ranked 1st in Canada and 15th globally for its research that can serve as a resource for the community of medical researchers and academics across the province and country. 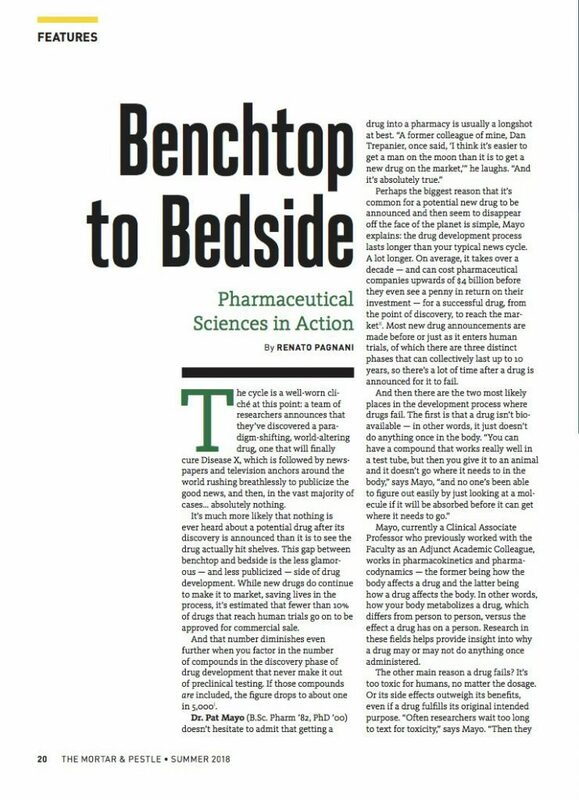 Drug development is a long and complex process that requires significant support, and Pharmacy and Pharmaceutical Sciences is at the core of that process. Pharmaceutical scientists have many crucial roles in ensuring a new drug flows smoothly through the drug development process, and experts at the Faculty of Pharmacy and Pharmaceutical Sciences have had a hand in bringing life-saving drugs to the people who need it for years.